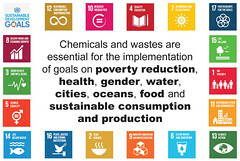 Sound management of chemicals and wastes is essential for sustainable development through its linkages with health (SDG 3), agriculture and food safety (SDG 2, 15), industrialization and economic growth (SDG 8), poverty reduction (SDG 1), cities (SDG 11), gender (SDG 4), water (SDG 6) and air pollution (SDG 13), and sustainable consumption and production (SDG 12). Among many other benefits, chemicals can help boost agricultural production, make water safe to drink and treat disease. However, they may also present risks to human health and the environment at every stage of their lifecycle, from production and use to storage, transport and disposal. The sound management of chemicals and waste is also important in areas such as education, gender equality, and climate change. Accordingly, the sound management of chemicals and waste is a key cross‐cutting nature and will contribute to overcoming global and local challenges. Thus, its full integration in the global sustainable development policy is crucial for societies to have clean air and water, sanitation, safe food, sustainable cities, while promoting healthy lives and sustainable economic growth. While chemicals can be an important contributor to sustainable development, a clear link has been established between poverty and increased risks of exposure to hazardous chemicals and waste: it is predominantly the poor who routinely face unacceptably high risks because of their occupation, living situation and lack of knowledge about the detrimental impacts of exposure to dangerous chemicals and waste. When it comes to global environmental challenges, both rich and poor are vulnerable to exposure from hazardous chemicals and wastes. As the Basel, Rotterdam and Stockholm conventions cannot and should not be implemented in isolation, they need to be integrated into national sectoral and sustainable development strategies. This would provide a crucial link for creating a nexus between environmental, social and economic considerations when managing hazardous chemicals and wastes. Supporting Parties to enhance collaboration with statistical offices, strengthen their capacities for data collection for the purpose of Basel and Stockholm Convention national reporting and SDGs global indicators and collecting data on the pilot basis beyond national reporting format.